Bangalore: When Pune-based sanitation services provider Saraplast Pvt. Ltd started hunting for funds late last year, it was confident of attracting investors. The company had all its documents in place, a three-year track record of profits and a business model that it thought could be scaled up. Vineet Rai, founder and CEO of Aavishkaar, talk about why social venture funds are so active despite the slowdown. Download here. However, Saraplast was baffled when investors indicated that they did not think its business of operating portable toilets was a business at all, even in a country where 55% of the population is forced to defecate in the open because of lack of sanitation facilities. Saraplast has 600 portable toilets installed across India, in areas with a paucity of sanitation services. The firm leases out these toilets to clients and provides waste evacuation services on site on a daily basis through its network of cleaning trucks. “We are offering a solution to address the sanitation crisis we are facing, but everyone is extra conservative. Our business would not appeal to a regular VC (venture capitalist), who looks at pure returns," says Rajeev Kher, chief executive, Saraplast. The bulk of the demand for Saraplast’s services comes from the construction industry, followed by tourism corporations, municipal councils and event organizers. 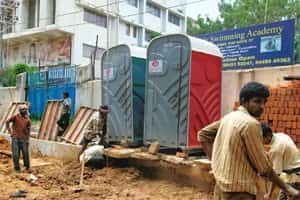 It is now in talks with the New Delhi municipal authorities for providing portable toilets for the Commonwealth Games next year. Saraplast is what is called a social enterprise, aiming to accomplish social or environmental goals, besides meeting financial benchmarks. The conventional wisdom has been that such ventures under-deliver on financial returns although they can eventually become self-sustaining. The firm ultimately found an investor. Micro-venture capital fund Aavishkaar India Micro Venture Capital Fund backed the firm in August, taking a 21% stake for an undisclosed amount. Saraplast is not the only social enterprise to be funded by Aavishkaar, which has backed four such firms this year. The investor deal-making spree comes at a time when VC funding in the country has declined by 70% amid the economic downturn. In fact, Aavishkaar, which had struck four deals last year, plans to double its investment this year. It is set to announce three more deals in about a month. When compared with conventional VCs, Aavishkaar is one investment short of this year’s most active VC firm, Helion Venture Partners. Conventionally, social venture funding is less than a fifth of VC funding in the country; there are only a handful of investors in the space and the size of these deals ranges between Rs10 lakh and Rs15 crore. What makes social enterprise investors tick? New unconventional sectors with unproven return records, the recession-proof nature of these businesses, opportunities to invest at a very early stage, small-ticket deals and the social impact of such projects. “We are trying to demonstrate a large number of deals at a very early stage. We are trying to create value by discovering new sectors which have social impact and can offer returns of 20%," says Vineet Rai, chief executive, Aavishkaar. Another prominent firm that has been making deals throughout this year, but has remained silent, is Acumen Fund India, the Hyderabad-based arm of a global fund. The fund has so far made five deals, as many as it struck last year. These deals are a combination of follow-on and new deals. The follow-on deals include Dial 1298 for Ambulance, which provides affordable ambulance services through an easy-to-remember telephone number, and Global Easy Water Products Pvt. Ltd, which sells micro-irrigation systems. “We have a mandate of committing Rs30-50 crore every year in India and we are on track," says Varun Sahni, director of Acumen Fund. A number of long-term foreign social investors are looking at funding Indian firms in the next 12-18 months, Sahni says, although liquidity is an issue for companies looking for short-term working capital. “Primarily, all funds believe in looking at the growth story, so be it drinking water, agriculture or education, there is a market size of 300-400 million people here," he says. Besides Aavishkaar and Acumen, other prominent players in India backing social enterprises include Omidyar Network, Song Investment Advisors and Bamboo Finance. California-based Omidyar Network has backed social initiatives such as the Rural Development Institute and Unitus Equity Fund, as well as Quikr India Pvt. Ltd, an online classifieds company. It is stepping up its plans to support entrepreneurship in India. It has committed $30 million (Rs142.5 crore) to support global entrepreneurship, especially in India and sub-Saharan Africa. “The ultimate goal of the commitment is to improve the quality of life for more than 10 million people living at the base of the pyramid," says managing partner Matt Bannick in an emailed reply.